Excellent customer service is vital for business growth as cliché as it may sound. Being one of the most important elements in sales and marketing, it needs deep focus and expertise, even in the consulting arena. Ron Kaufman, ranked as the number one customer service guru in the world by Global Gurus, knows the drill. As he dives into his journey from managing Frisbee festivals to exploring and winning in the consulting and speaking fields, Ron provides knowledge and insight for consultants on mastering sales conversations, building valuable relationships, understanding the concept of “service,” and learning to productize your product. On top of that, Ron discloses that the unique approach they use in Up! Your Service is now up for grabs. I’m very excited to have Ron Kaufman joining us. Ron, welcome. Let’s start off and have you share with those who aren’t familiar with your work a little bit about yourself. Anybody can find me at RonKaufman.com. I’m the author of a New York Times bestselling book called Uplifting Service: The Proven Path to Delighting Your Customers, Colleagues, and Everyone Else You Meet. Global Gurus rated me as the number one customer service guru in the world. That’s in the advertising. I’m a keynote speaker. We have a company called Up! Your Service that helps large organizations in all industries all over the world and in many different languages to improve the quality of service provided inside the company between different departments and divisions. Then externally with customers, clients and colleagues. Something else that’s a little bit more eclectic, I’m in the Ultimate Frisbee Hall of Fame. I go all the way back to the era when the sport Ultimate Frisbee was first created and I’m one of the guys that took it out to the college circuit and then to Europe and China and the Soviet Union and other places around the world. I need to start asking questions where people will share something like that. I don’t ask that question, which I know some podcasters do about, “Tell me something that no one would know about you,” and you just share right off the bat. I appreciate that. I would have never guessed that or even thought about Ultimate Frisbee. I don’t understand the game. I see people playing it sometimes at the beach. I don’t know what they’re doing, but it looks like they’re having fun. I want to start off by exploring a little bit of your background. Your clients include Xerox, Sony, Singapore Airlines, Microsoft, Hilton and just a whole bunch of other global brands that everyone would know. Let’s go back to where things got started or the beginning. How did you get into the consulting and speaking world? The Frisbee thing connects to this and let me help put the two of them together. The very first rule of the Ultimate Frisbee game that you see people playing and enjoying so much is called the spirit of the game. The players are themselves responsible for the conduct of play, the spirit of sportsmanship, the relationship that they have with each other and the enjoyment that they bring about no matter who wins or loses in the game. There are no referees on the field. It’s up to the players themselves. That whole spirit was within me and that participatory throb that there is within the Frisbee and that sporting community wants to get everybody involved. I wasn’t just a tournament producer or a team captain. I organized festivals to get the general public to come to the park, to enjoy the day, to watch the dogs, to learn to play, to play with their kids, to learn a new Frisbee sport. All of that was in the foundation when way back in 1990, I had an invitation from the government of Singapore to come all the way from where I was living in the West Coast of the United States. It’s an invitation to Singapore for one week to help contribute to a project. That project was the creation of something called the Service Quality Center. In the little country of Singapore, all the manufacturing had moved to China and was going to continue to go for lower cost advantages. All of the back office and the data processing and the call centers, those were migrating to India. You had this little country that was seeing its economy hollowed out. Its government realized very pragmatically that they needed to move up the value chain. They should be able to deliver something to the rest of the world, so the rest of the world would still need this little well positioned but otherwise not resource-enabled country other than people. They realized it had to do with service. The problem was that the educational system was training people to work in factories. 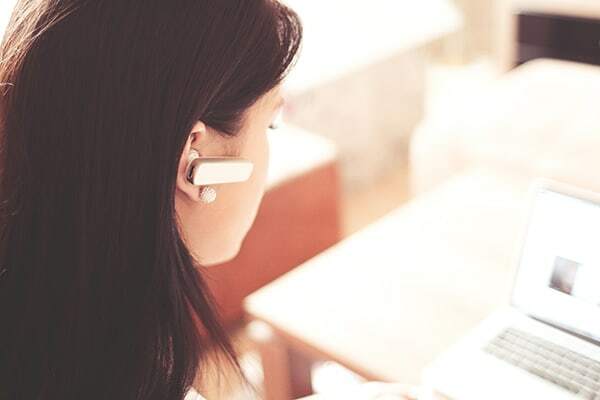 In customer services, you’ve got to be flexible, proactive, responsive and collaborative. They needed to re-educate the entire nation on how to be more oriented towards customers and towards service. It’s been very successful. Now Singapore is known for medical service, financial, legal, hospitality, research, supply chain. It’s all a node of great service value on the planet. That’s what’s underlying the success of the nation. How did you get to Singapore? You said that the invitation was extended to you to come and be a part of this new center that they were setting up or this initiative. Why did they call on you? You shared with us that you are organizing Frisbee festivals. How do you go from Frisbee festivals to getting invited by a nation to come in, support and work with them? In doing Frisbee festivals all over the world, what I learned as I got it as an embodied skill is how do you get adults to learn something new. There are two key elements. One is, you’ve got to get them in a good mood. You get an adult in a bad mood and they’re not going to learn anything. They’re already totally shut down. At least with a kid, you can shift their emotions pretty fast. With an adult, you’ve got to get them into an open up minded mood. The second is you’ve got to get them involved. I learned that on the Frisbee field because if I can’t get a father or a mother or a kid to come out and get involved and be joyful about the fact that the first several throws didn’t go so well, then they’re not going to even stick around to learn how to throw, how to catch and how to play the game. Over here in Singapore, when they were working on building a service curriculum for the nation, they went to the large consulting groups. They talked with MicKinsey, Bain and Boston Consulting Group. These big players would say, “We can do that.” When you get down to the crunch of it, how are you going to take 800,000 adults, many of whom were speaking different languages? They have different levels of competencies, different educational levels and you want to teach them to serve somebody else. We’ve got to get them in a good mood. Then we’ve got to create ways for them to participate that are non-threatening but where the lessons will still come through. When I got in touch with Singapore or they got in touch with me, they said they wanted to do this in an experiential way, doing something called a boot camp. I said, “Great, what are you going to do with the boot camp?” They said, “We’re not sure yet. Do you have any ideas?” That was like asking an evangelist to go take on the world. They brought me here for one week. That week became a second week, became a month, became project manager over seven months. I became the master trainer that trained hundreds of Singaporeans how to teach the curriculum to others. The identity started to grow. The business kept coming in. I ended up staying here and now a citizen of Singapore. I’ve been living here for the past 29 years and I travel all over the world. I’m on about 100 flights a year. How did they discover you? How did they find Ron Kaufman? After they had tried and not been satisfied with the major consulting groups, they were literally grasping at straws. They met somebody who is strong in the hospitality sector, who knew how to help groups open new hotels. When you open a new hotel, you’re starting from scratch. You may have people who are experienced in the industry, but they may not be experienced in working with each other. There’s something that’s nascent about that whole situation. That person knew somebody who was a Swiss hotelier, who’s somebody I met and he said, “I know this guy. He’s an unusual character. He’s young but he’s very creative and enthusiastic and he presents well,” and my phone rang. It’s amazing how things like that can come together. It’s not necessarily a direct path. That sounds like the opposite of direct, but it worked for you. You mentioned that to get people to become involved or have them participate in what you’re doing or to get them to a certain destination, you need to make sure that they’re in a positive state and get them involved. When you were sharing that, my mind right away is going, “That applies 100% to having a sales conversation with a prospective buyer.” What are your thoughts on that? Have you applied that mindset or that approach to your active sales conversations with buyers? Let’s unbundle that. Service is taking action. You got to do something like a sales conversation is opening up your mind, opening your ears, opening your mouth sometimes, taking notes, listening, making proposals, creating offers, counter-offers, negotiations, ultimately coming to an agreement and you sold the deal. That’s the action that you take. What’s the purpose of the action? It’s to create value for you, but it’s also to create value for the person you’re selling to. Who is that someone else that you’re selling to and what is it that they value? That’s where the definition begins. Not with the action that you take like, “How do I overcome objections? How do I stand up and make a presentation?” It’s with understanding what the other party wants to value. Different people value different things. 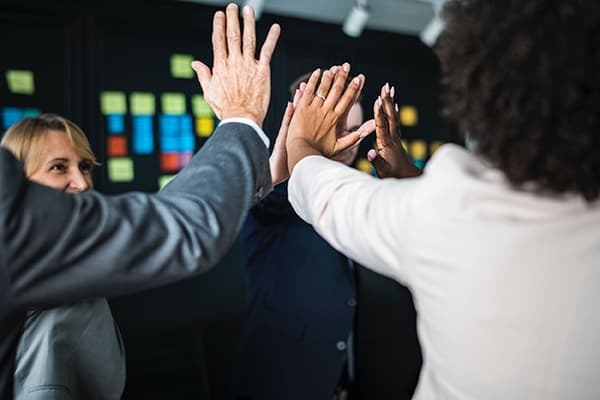 When you talk about a successful sales conversation, that definition of service can be very useful for any salesperson who wants to do it well. That’s directly applicable. I appreciate you sharing that. You’re an expert in customer service, and many people see or have the idea of customer service as being something that larger companies have problems with or that they need to work on. 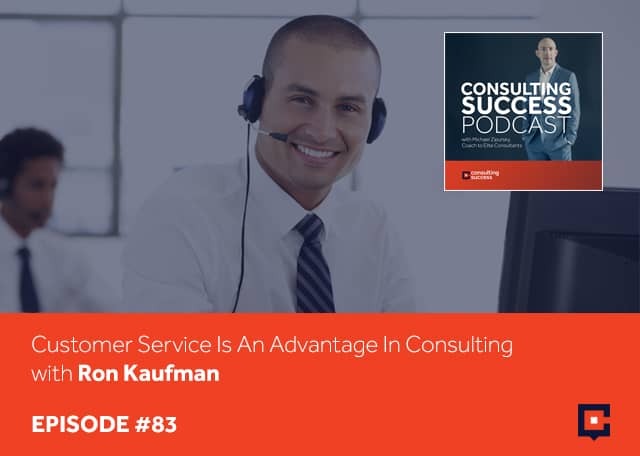 What opportunities does the independent consultant or the small consulting firm owner have to apply customer service principles or even strategies or approaches into their business? What advantage can someone create even if they’re a smaller firm owner? I want to make a distinction between what I call customer service or internal service and service culture. You mentioned the large organizations that we consult for all around the world. You mentioned that many of the consultants themselves may be selling to and serving large organizations. 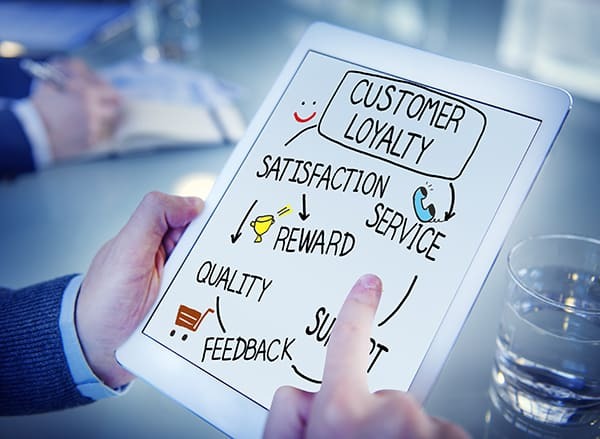 You should understand that providing great customer service or what we call service excellence, means that in that actual relationship and the various transactions associated with one party serving another, you want the experience to be an excellent service experience. A service culture is an entire organizational ethos. a way of working, recruiting, compensating and communicating that says, “This is who we are. 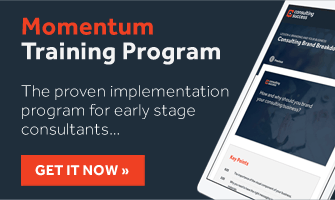 We’re constantly focused on finding the next step up that will create more value.” If you’re a solo consultant or you’re working in a small SME group with a small team, then your service culture is probably going to be much easier to implement than in a larger global organization is going to be challenged with. It’s important to understand the distinction between those two. To answer the question about how can a solo consultant or an individual consulting talent do better, I would say the first thing is you have to accept that outstanding service is a domain of study. This is not something that you just say, “I feel like I’m a wonderful person and I care about my customer. Therefore, I’m going to give them good service.” There are fundamental principles of service like A) understanding that definition, B) understanding how do other people evaluate the service that you provide, C) noticing what are the key perception points within a relationship, within a dialog, within a service transaction process like presenting a proposal or negotiation or a client review. What are the perception points at which the other party evaluates the service you’re performing? For any small consultant, how can you differentiate by creating more value than anybody else in some particular area? We call that the four categories of value. The point I’m making and to answer your question is people have to study this domain. Just because it’s soft, it doesn’t mean it isn’t actually rigorous and not very well taught in school. Is there one example that you can offer that you’ve applied to your own business or that you’ve seen another consultant or a small firm apply to their business that has worked well? Whether it’s around the proposals or around the conversations or around the marketing or how they handle inbound leads, whatever it might be. Are there one or two examples that you could share to illustrate this for people? I can share with you an approach that we use in all of our sales conversations. Even if they show up asking, “Tell me about what you guys do or how much does it cost for? I saw this online and I’m interested to know more about.” Before we get into that conversation, we need to understand, “Tell us about you. Tell us a little bit about your position within this concern that you have.” What’s the background of it? What is it you’re challenged by? What is it you’re seeking to achieve? Who else is involved in this with you? It’s not like we’re going to put them up against the wall and do an interrogation. It’s just that 100% of our exploration, of what it is that other people are calling us about, how did we end up in this conversation in the first place will help us do a much better job of then being able to decide what to present, how to present, what to explain and what to offer. If we go right into answering the questions that they show up with, we very often will miss the mark. We’ve learned that over many years. We have a whole getting-to-know exploration process. The wonderful thing is how much clients appreciate that. People would like to talk about themselves. If you show up genuinely curious, they will genuinely tell you a lot. It’s like the doctor who would prescribe before diagnosing. That would be considered malpractice. A good doctor or physician is going to diagnosis and spend a lot of time asking questions to understand better what the patient is dealing with right now before they can prescribe the next step or solution or whatever it is that they’re going to take. That point is important. I hope that everyone reading is looking at what you’re doing right now in your business and how you’re approaching conversations. Even though you might be speaking to a buyer that you see as being much larger, much more powerful and who might in some ways even demand or come across to you as demanding to understand, “What are your fees and what can you do for us?” you need to take the stance of first saying, “I’d love to help you with that, but first tell me a bit more about your situation,” because that does lead to a much more meaningful conversation for all parties. Help me get to know you. I also want to point out something about the metaphor that you use of the doctor, not doing malpractice by diagnosis and prescription prior to understanding. A doctor’s relationship with a patient tends to be fairly short-term. There is a diagnosis, then there’s a prescription or whatever. The concern becomes compliance. In other words, will the patient do what the doctor told them to do? That’s a big issue in the medical industry. In a consulting situation, very often what we’re entering into when they say yes and buy our services is not just, “Here, I’m going to give you the solution.” It’s a deeper relationship. The medical profession is a healing profession, not just a fixing profession. We have discovered and all the sciences coming out that’s backing that, that the relationship with the doctor has an enormous impact on the success of the healing progress for the patient. In this case, if you’re a consultant with a client, you don’t just want to diagnose and prescribe. What you want to do is engage in a relationship. That begins from the first conversation. You have a testimonial on your website that is quoted from Toyota. This is about you, Ron. “You opened our eyes to the power of service to help us win and keep good customers.” I lived and built a business in Japan. The Japanese are well-known for their respect, care and high levels of service. What did you share with Toyota that made them say that and made such an impact on them? They’re in the automotive industry. They’re going head to head with Nissan, Honda, Kia, Hyundai and all the American car and European car manufacturers. There’s always going to be a product to product comparison in terms of price and features and style. There’s always going to be a sales-oriented focus of getting that volume out of the factory, getting it through the distribution mechanism, getting it into the dealerships, getting the dealers to complete the sales conversations. Let’s be honest that once that sales conversation happens, the sales commission is paid out once it’s successful. Then the question of servicing the customer happens over there in the workshop. That’s after the sale. “We hope that they do a good job. We don’t want to get customer complaints, but we’re busy selling new cars.” The reality is that at two to three to four years, the buyer of that new car is ready for another new car. Their decision about whether to stay with the brand or move to another brand will be critically made in large part based upon the quality of the service conversations that they’d been having throughout those two, three or four years. Should salespeople be not just concerned about it like, “I hope you guys are doing a good job,” but be involved in that? When you buy a new car, will they walk you back into the workshop and proudly introduce you to the people who are going to help you take care of your new vehicle for the next several years? Do they not want you to see what’s going on in the workshop because this is a new car? It should never break down. It should never need service. The reality is it’s going to break down. It’s going to need service. You want that service relationship inside the organization to be positive in both directions. The salespeople themselves can also very much contribute to new car sales by saying, “We’re working on this. This is great. By the way, when it’s time for you to upgrade to a new car, while we’ve got your car here in the shop for the afternoon, have you seen the new models that just came in. Let me walk you in there and introduce you to my friend who’s over there on the sales floor.” It’s not being pushy but look in that and think about that relationship between service and sales that’s not traditional in the automotive industry. As you’re sharing that, I see values ran across my mind right now. Just having you explain that and certainly, I would agree. I haven’t seen that approach being used. How did you get to that approach? How did you identify that as an opportunity for Toyota in this case, being your client at that time? Service is always a longer-term relationship. We can look at something like it’s a one-off, one shot, very fast transaction. Let’s use banking as an example. Somebody is in a foreign city and they’re still carrying cash. They want to change the cash at a money changer. They walk up somewhere. They changed the cash and they walked away. You could say that that face-to-face interaction will never happen again to those two people. True, but the way that goes down is going to have some impact on the emotional experience that the customer has about the city that they’re in. That emotional experience is going to affect their spending and it’s going to affect their social media posts and it’s going to affect their desire to come back to that city again. That money changer depends upon a constant flow of people who are coming in to do those cash transactions. Let’s go to a banking situation where you want to go to an ATM or you want to wire transfer to somebody overseas. You’re going into the bank. It’s not a long-term relationship. It’s just a transaction, but the customer’s experience with the bank is going to have a bearing on what other assets or products do I want to bring under this banking portfolio if that’s the bank that I use. Most of us bank with more than one bank. That’s not profitable for the bank. That one transaction could turn into a deeper and richer relationship. When you go all the way up and you’ve got a full portfolio of products and you’ve got ongoing customer care, this is never about that moment of service. It’s about the larger and longer context in which we all live together. You speak, you consult. You’ve written your book. Of those three, how would you break them down in terms of the portion of your business? Is speaking by far the majority? How would you look at that on a pie chart of your current business model? Let’s start with books since you mentioned it. A book is a brochure for your business. A consultant who writes a book wants that book to be able to be a fabulous business card. You want to be able to bring them a personal, signed copy complimentary of your book. If there are six people on the committee that are evaluating you, you want to bring six copies of the book. The purpose of that book is to sell the business, is to explain the business, is to position the business. I don’t look at my book writing, fifteen books, some of them self-published, some of them published by known publishing houses, distributed around the world and translated into different languages. That’s all part of the marketing and promotion of the services that we provide. Keynote speaking, getting up on stage. I’m the guy with the microphone, 60 to 90 minutes, half day, sometimes it’s a full day, in countries all over the world, four different size audiences in different industries. There was a time when that was 100% of my business. I was on airplanes more than I was in what I call home. What happened was that I got concerned about the fact that I can do this amazing talk and the client would say, “That was fantastic. You opened our eyes.” What happens the next week and the week after that? I looked at how can I do a better job of serving my clients longer term? I took all of what was the intellectual property, the distinctions, the principles, the strategies, the practices, the case studies, the templates, the worksheets and turn it into a Train-the-Trainer based program. We have a team of people, we can go to a client and I can go do the keynote speech. People go, “That was great.” Then it immediately opens the conversation how do we sustain this? How do we get the people who were in the room to even get a look at it? How do we help our people implement this over time? Now we have a Train-the-Trainer solution. I’m glad to let you know that the company Up! Your Service, the total revenues of that company, my keynote speaking was about 10% of the revenues. Tell us a little bit more about what that model looks like. One other question that I had for you is with Up! Your Service, it has its own separate website. Clearly, you’ve built that as its own brand. It has other people involved in it. What does that model look like in terms of the management of it and the actual number of trainers? How do you manage that business? That business for your audience is found in UpYourService.com. That’s the company website and you’ll see a link in there somewhere that goes back to my personal website at RonKaufman.com. We’re very clear that these are two distinct brands who support each other. The Up! Your Service company right now has got south of twenty full-time employees. We’re not a big company, but our people are located in the United States. We’ve got a colleague who’s based in the United Arab Emirates. We’ve got a team that’s over here in Singapore. Our Team in Singapore has got people from Australia, from India, from the Philippines. We’re serving all over the planet. It’s not that we have a big team, but our Train-the-Trainer model is designed for scaling into our client organizations. There are more than 2,000 people in some of the largest brand names around the world who’ve gone through our Workshop Leader Certification Program, which we do live in person or we do it in a virtual online format. Then those are the people who in turn cascaded the training, the teaching, the workshops, the principles to many more thousands within their organizations and within their local languages using case studies and adapting our principles to their particular industry or to their internal or external service situations. For those who are not familiar with Train-the-Trainer type of model, can you explain that briefly in terms of what that looks like? If you have somebody who’s a solo consultant, let’s take you, me and a bunch of others reading this. You’ve developed some way of doing something, some principles, some step-by-step model, some sequence, some approach. Let’s call that your intellectual property and you’re great at it. You go out there and you sell it, but then you’re also the one who delivers it. How do you get somebody else to deliver that so you can go sell more or get somebody else to sell it so you can deliver more? If you codify, you’ve got to structure; you’ve got to define, you’ve got to knuckle down and buckle down that intellectual property so that it can be shown to somebody else. It can be taught to somebody else. That might mean manuals. It could be videos. It could be PowerPoint slides, it could be workbooks, it could be an online platform. Once you’ve built your IP or intellectual property into that consolidated set of content, that has tremendous value. If you design it in a way that it is teachable to someone else for them to use with someone else, that’s called Train-the-Trainer. You had initially taught this to your first trainer within your brand. That trainer would then go into an organization and they would then teach that to someone within the organization who then teach it to the employees of the organization. It’s a little bit like one more step, but basically what I did is I taught it to our master trainers. Our master trainers run the certification program of what we call workshop leaders. The same thing as trainers. The only reason we are using workshop leader is that in the world of customer service, we need people to work on this together in a workshop environment. It’s not like training where you’re just acquiring a new skill. You have your master trainers then certify other people in your IP. They are the ones that then go off and deliver it to organizations. That’s right. They run those workshops or for the 2,000 that we have, those are people inside our client organizations. Let’s take XYZ company, the people who become the certified workshop leaders, they’re employees of XYZ company and they’re running workshops for their colleagues within the organization. The business model of that is it’s a licensing agreement. We are then charging a certain amount for certification of a workshop leader and then that company is buying a license to be able to use our intellectual property and all of the materials we provide for everyone within the organization around the world. Does that fee depend on the number of employees that it’s going to be delivered to? What are the factors or criteria that you use to decide what the actual fee is going to be for each company? In the old days, we used to do it by how many people. Let’s say they’d buy for 1,000 people. Then they would burn down the thousand, but then the problem was what do you do with the thousand and first person? What we do instead now, we’ve learned this over the years, is we do with licensing for what’s called a community size. Let’s say their organization has 5,000 employees. They will get a license for an employee community size of 5,000 which includes turnover. Now what happens is new people come into the organization, the organization is still 5,000 people and they bring them into these workshops as part of the orientation program. This methodology also allows many of our clients to have a community size that would include their resellers, partners, distributors, vendors, suppliers. In other words, they may have more people within their ecosystem who they want to understand the same common service language and apply these same tools and principles. The licensing agreement that we have with them allows them to do that. One of the biggest questions or concerns that I hear from consultants who want to start productizing their offerings or teach it to others that can then deliver it to other clients and so forth is this idea of, “The client wants me. I have a relationship with a client. They want my time and so forth.” Was that a concern for you in the early days? How did you deal with it? Being a solo consultant or a very small team is a fabulous line of business because you get to essentially retain your freedom. When I was a pure keynote speaker, I had schedule freedom like I don’t have now because we have a team and I have a leadership and a management role of that team. It’s a shift in your own lifestyle, which sometimes people don’t anticipate and like, “What have I done?” I don’t have regrets for having done it. There were a lot of things that happened to my lifestyle about needing to be obliged to, the responsibilities of taking care of a group of people that’s very different than being just the solo superstar. I put a cautionary note out there that people should reflect very seriously about whether or not they’re passionately interested in it. If you are interested in building a business, then you need to be very careful about having your name on the door. This is the John Jones and Associates company. It’s going to be difficult for anybody else one day to come along and want to buy that business because your name is all over it. Then what you might want to do is think about naming it more based upon the area of value that you create or the nature of the service that you provide. For example, a company called Up! Your Service may be founded by Ron Kaufman. You can go on that website, scroll down and you’ll find me on that website, but it’s not me front and center. It’s our clients front and center. It’s our methodology front and center. It’s testimonials front and center and it’s members of our team all over the site, all over the blog. Ron, I want to thank you so much for coming on and sharing. There are so much here for people to take in from ideas around the sales conversation, how to connect and build more valuable relationships, how to serve more, to what we talked about now about the idea of productizing and looking at how you can take your IP and leverage that. I want to make sure that people can learn more about your work and your other brand as well. It’s RonKaufman.com and then UpYourService.com. I want to just make one last point. I want to bring us back to the Frisbee field to close our conversation. The first rule of the game is called the spirit of the game. We are ourselves responsible for the sense in the spirit of well-being for everybody who’s in the game. If you’re in consulting and you’re in sales, you’re in the game with other human beings who have businesses, concerns, families, neighborhoods and lives. When you bring an uplifting spirit to the conversations you have with other people, that will help them be more uplifting in their next phone conversation, their next text message to their spouse, the way they treat their kids when they get home. It does make an enormous difference not only to your business success, but to the way all of us are growing in the world together. Ron Kaufman, thanks so much for coming on. It’s my pleasure to be with you, Michael. Good luck to the audience.